Today is another Challenge Me Monday at Fantabulous Cricut Challenge Blog. Before I share my project, I would like to share with you that I will be staying on the design team for another term, yeah!! I have had such a blast creating and being a part of Robin's wonderful challenge blog. These gals are the best and so fun, talented and inspirational. I have made some wonderful friends and look forward to getting to know the new members that were just brought on board:) Thanks again Robin-I am honored! The challenge today is: Luck of the Irish-to create a St Patrick's Day project. 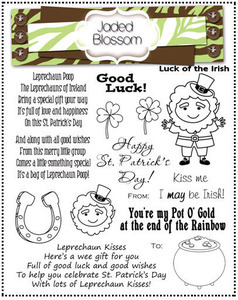 We have a wonderful sponsor this week and I was fortunate to be given an awesome stamp set from Jaded Blossom -Luck of the Irish to create with. What a FUN set for St. Patrick's Day! Be sure to stop over and check out the wonderful stamps for sale Here. I made a cute little candy pillow pouch for my project today. I cut the pouch from the Art Philosophy cartridge at 6 1/2. I cut it a second time in pattern paper and trimmed it back and pieced the layer on top. I inked around the edges using SU-Wild Wasabi ink. The leprechaun is cut at 3 1/2 plus the layers from the Simply Charmed cartridge. I embossed some of the leprechaun layers using the houndstooth and lattice folders. The label is from Spellbinders-Labels Nine set and the awesome sentiment is from Jaded Blossom~Luck of the Irish set. I added a little bling, some ribbon and of course filled this with some yummy chocolate kisses to finish it up. I think I will be making a couple dozen of these to take to my co-workers at work. Cute, ha? Now, be sure to hop over to Fantabulous Cricut and see what the Design Team has created for you. We hope you come join us in the challenge! can't wait to see what you create!! Love your candy pillow box! The leprechaun is so cute. Love the candy pouch, it is adorable! Thanks for sharing! Very cute! Great idea to add the layer to your pillow box with the pattern paper! Such a super fun project Sherrie!! Love the pillow box and the sentiment is great!! TFS and congrats on staying on for another term!! You have outdone yourself once again! Well done, my friend! This is soo cute! I love that little pillow box! Thank you so much for showing off the Jaded Blossom stamps! This qualifies for the JB challenge too so make sure to come over and link it up! This is so cute. Don't you just love their stamps. So glad to hear you had fun with your sister. Congrats on staying FCCB. super cute.they will love this party favor. Oh, I want to be able to make pillow boxes! I don't know if mine would ever come out as cute as yours, sweet Sherrie! What a fantastic pillow box! I am eager to make one.. they're just such fun, aren't they? Yours is positively delightful. The paper is so pretty and I love the sweet leprechaun! The embossing is gorgeous. The sentiment is beautiful.. I love that font and love that you stamped it in green. :o) Beautiful work as always, my friend! Super cute Sherry! I love this little guy! Your candy pouch is so so cute. That klittle leprechaun is just adorable. And I especially love the embossing you did on him. So Cute!! Sherrie, this is soooooo cute!!! I mean really and I love how you embossed his beard and hair! Instant smile on my face! Just darling! Oh Sherrie, this looks just like my Irish son..lol..just kidding..no really poor kid, he is a red head with the map of Ireland on his face! I just looked today and I don't have any St. Patrick's day stamps! Gonna have to get some! I love your pillow box! OMG...this pillow box is so super cute! I love the details! Love it and the embossing, papers and bling. Cute, cute and CUTE! I love that sweet little guy and your papers are just perfect...love it! ADORABLE!! This is the most perfect little box for St. Patrick's day treats! Your co-workers will LOVE it! Sherrie your little leprechaun is so cute. I love this cut. The orange hair is perfect. Congrats on your second term, you do a wonderful job. Sherrie so delightful St. Patrick's day perfection! This is so incredibly sweet, Sherrie! I love the little leprechaun - especially with the embossing. It's perfect! Oops - and I forgot to say that I'm so pleased you had such a wonderful time with your sister! Sounds like so much fun! This is soooooooooooo cute cute cute!!!! I loveeeeee that little leprechaun!!! Very Cute Treat Box. Love the little leprechaun. This is oh so cute! Love the pillow box! Love that leprechaun. cute little box. Sherrie your little leprechaun pillow box is so cute. Love that little guy. Congrats on another term at FCCB. Sherrie that is awesome as always!! I love the cut you used and the patterned paper is perfect!! Now this is just toooooo darn cute! I love that little Leprechaun and your adorable box!!! Glad you had a great time with your sister -- nothing like family! Congrats on staying on at a DT Member so exciting!! Now on to the project, wow, wow and wow! I love this little guy!! I love the background paper so Irish looking!! Thanks for entering the challenge at Jaded Blossom whoo hoo ! My goodness you are a popular lady! You've been winning goodies all over the place including my blog and on Naomi's blog if I remember correctly! This is such a cute project, Sherrie! I just love it! I really like the papers you chose for the whole thing. Very cool! Thanks so much for leaving such nice comments on my blog. I'm so sorry I don't get over here more often, but this term I'm certainly gonna be better about that! I've always loved your designs. You do such a great job! This is sooooo cute!!!! I love it!! Thanks for playing along with the Jaded Blossom Challenge!